Dr. Doss graduated from the Southern College of Optometry in Memphis, TN, in 1998. He completed his internships in ocular disease, low vision and vision rehabilitation. 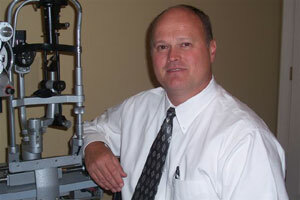 Dr. Doss has been practicing optometry in Commerce for 20 years. He has served as President and Treasurer of the 9th District Georgia Optometric Association (GOA), was selected for Leadership GOA and was appointed as Chairman of the Members Benefit Committee and a member of the Elections Committee. He is also a member of the American Optometric Association. Dr. Doss is married to Shelia and they have one daughters, two sons and two grandchildren. They love camping and fishing. Dr. Sams is an Athens, GA native. He graduated as Valedictorian of Presbyterian College with a B.S. in Biology. After receiving his medical degree from the Medical College of Georgia where he graduated with highest honors in Alpha Omega Alpha, he completed an internship at Baptist Hospital System in Birmingham, Alabama. He completed a residency in ophthalmology from the University of Virginia at Charlottesville where he was chief resident during his final year. Dr. Sams became a partner of the practice in December, 2009, and he is certified by the American Board of Ophthalmology. He is a comprehensive ophthalmologist who treats and performs surgery on diseases affecting the eye. He specializes in anterior segment surgery, including cataract surgery using the newest technology of implantable intraocular lenses. 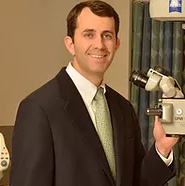 He is an active member of the American Academy of Ophthalmology, American Society of Cataract and Refractive Surgery, and the Georgia Society of Ophthalmology.